An all-time favorite of the Germanic mountain people, especially the Swiss, muesli is an all-round can’t go wrong health food. Even with the most basic and minimum ingredients, it will have enough power and nutrition to last for hours on top of hours. It’s an original superfood, and it tastes great too. Muesli is a traditional breakfast of the German speaking Alpine regions, primarily made of uncooked rolled oats, fruit, nuts and dairy (usually yogurt). Traditionally, the muesli was made as a mash-up of the oats, fruits and nuts, and dairy may or may not have been added just prior to consumption. 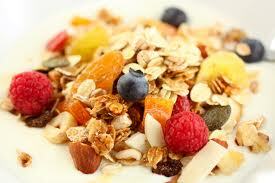 Hence muesli ‘cereal’, as you may find in markets, will resemble ‘cluster’ or granola type cereals. My version, and most other versions, will have the dairy component as in integral ingredient, not as a selective finishing touch. Muesli is of course easy to make. Oats, some sort of fruit, yogurt, a little milk and maybe a touch of honey and you’re done. Personally, I like to add a few extra ingredients, but like everything else you make, it’s yours, make it how you like it. This is incredible power food. A cup of muelsi in the morning and you’ll be set for any workout, physical activity, or simply utilize it as brain food and a great all-round breakfast. It’s a classic super-food. In a mixing bowl, add everything except the milk and banana. Mix well. Add the milk just to loosen. Transfer to an airtight container and refrigerate for 8 hours. The oats will absorb most of the liquid. If it is too dry, add a little more milk. Portion it, slice the banana over the top and eat right away.